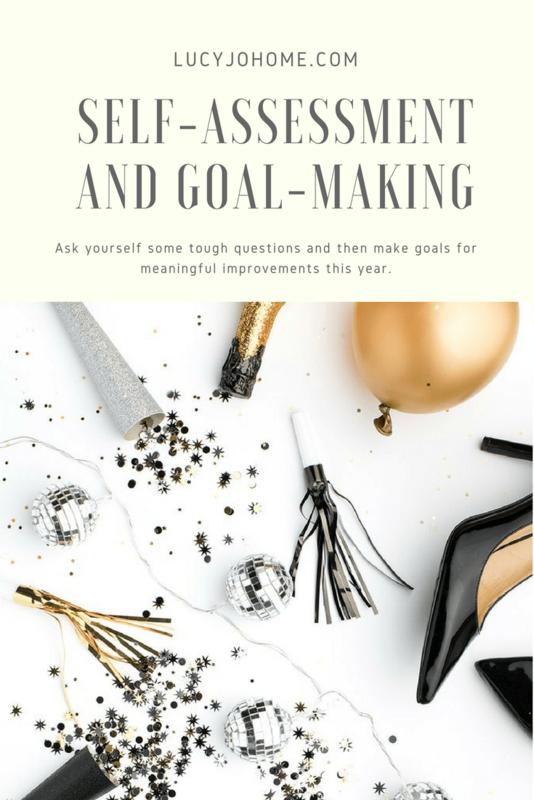 It is a perfect time to take a self-assessment and make goals! As you plan for this new year, make some solid plans and goals for your home and family. Cody and I sat down a few days ago and really evaluated where and who we want to be (goals) and then discussed the way we are going to accomplish it (plans). Our biggest goal is to be debt free and have a good savings (at least $1000 dollars in a savings account at all times). We have always had a loose budget, but loose is not what we are aiming for. We want a water-tight budget where we know, down to the cent where our money is going. It feels so good to be on the same page with Cody about our finances. We have always talked about money and we view any and all income as ours vs. yours and mine. This has been a major help in our marriage and I know that we will be able to meet our goals because we are doing it together. We also want to make more meaningful memories. At first I thought that a tight budget and and making family memories would be at odds with each other, but I can tell you the the more aware you are of your money, the more opportunities will be available to spend it on things you value. So, now that you know a couple of our family goals, here are some questions to ask yourself and your family. I will also share some tips on how to meet the goals that I have some experience with. Do you have a strong and sustainable budget? Do you have debt that needs to be eliminated? How can you assess your spending every time you make a purchase? Is there something that I already have that will do? Does this purchase align with my values? Will this purchase help me meet important goals? Literally record every single purchase in a notebook. When we write things down it brings it to our attention. Are you living your beliefs everyday? Do you have a personal relationship with your spiritual source? Do you study your spiritual beliefs everyday? Do you take time each day to meditate and reflect on your life? Do you teach your beliefs daily? Do you use your spirituality to help you resolve your problems and help others? Set aside time in the morning or another quiet, peaceful time to study your beliefs and meditate. Hold a weekly family home evening. This is simply time to teach your family, plan, and connect in a positive way each week. Commit to living your beliefs each day. Maybe consider one belief that you struggle to practice. Are you reading something instructional or inspirational each day? Are you listening to something instructional or inspirational each day? Do you consider what you are grateful for each day? Do you surround yourself with positive influences (people, media, etc) each day? Do you say no to requests or obligations that do not align with our core values? Check out my post about value-based planning and living. Do you have a good mentor? Do you stay current in your field? Use your local library as a resource! There are so many books and audiobooks that will allow you to learn. Books and CDs can become a mentor. Podcasts and websites are places to stay current and to connect with others. Limit or eliminate time with people that do not lift you up. Write down your top ten values and make sure your decisions align. Are you doing strength training, cardio and stretching at least 3 times a week? Are you eating well, especially breakfast? Do you spend time outdoors each day? Are you sleeping well (at least 8 hours)? Do you limit your TV consumption? Find an accountability partner and a good fitness and nutrition program you can sustain. Consider what you will not be able to do if you don’t take care of yourself physically. Make a specific goal: marathon, mountain climbing, amount of steps each day. Don’t buy what you don’t want to eat and make a solid weekly or bi-weeking menu that meets your nutritional needs. Do you trust the people you live and work with? Are you spending quality, focused time with your family each week? Do you get together with friends once a week? Are you trying to find ways to improve yourself as a spouse, parent and friend? Do you communicate well with your family and co-workers? Do you know when you need help and do you ask for assistance? Consider planning a monthly or weekly date with your spouse. Plan ahead and do not let anything get in the way of your time together. Take each child out for one-on-one time with you so that they can feel your love and have a chance to talk to you privately. Plan fun, productive and uplifting meetings with friends. Even me, an introvert, gets energy from being with friends often. Work on talking with family and friends openly and calmly. I need to work on positive communication with my children. Do you have a hobby that fills your bucket? Do you serve your community? Can you spend as much time as you want with family and friends? Do you plan adventures that stretch you and introduce you to new things? Do you give yourself time to daydream? Are you present in each moment? Do you attend cultural events at least once a month? Do you vacation at least once a year? Figure out what hobbies you love and plan them into your week. Plan your family vacations and events ahead of time and then stay true to your plans. It is easy to let others plan your life for you if you don’t have things planned. Find ways to be present in each moment. I put my phone away and focus on my family or my task so I can be truly present. Put your goals somewhere you can see them easily everyday. This is a new goal for me. *Some of the questions are adapted from Darren Hardy’s Compound Effect. I hope you that you year is filled with progress and peace! I am excited to share with you our triumphs and the hard lessons we will inevitably learn.